It only feels like two minutes ago since Piglet was born. Those early days when all she needed was cuddles, feeding, and nappy changes. Whilst she is still very much a baby in my eyes there is no doubting that she is very much on her way to becoming a toddler. So different in many ways to her siblings at this age, she is into everything, pulling herself up on the furniture and escaping out of the safety gate at any given opportunity. As I approach her first birthday (how can she be almost one?) I have been looking at walkers and activity toys. Looking for something that is going to grow and adapt with her rather than a baby toy that will be discarded in a month of two. A ride on toy that has activities and can keep her entertained. Sit & Play – busy activities include 10 light-up buttons that activate fun songs & phrases – plus a spinner to click, a nose to press, a mouth to fill, and a butterfly to flip over! Push & Walk – the seat pops up to become a handle to help make first steps steadier – with encouraging phrases & songs that invite your wobbly one to walk more. Scoot & Ride – drop the seat down to turn the lion into a ride-on for lots of fun scooting – and encouraging rooting from the fun phrases & songs! 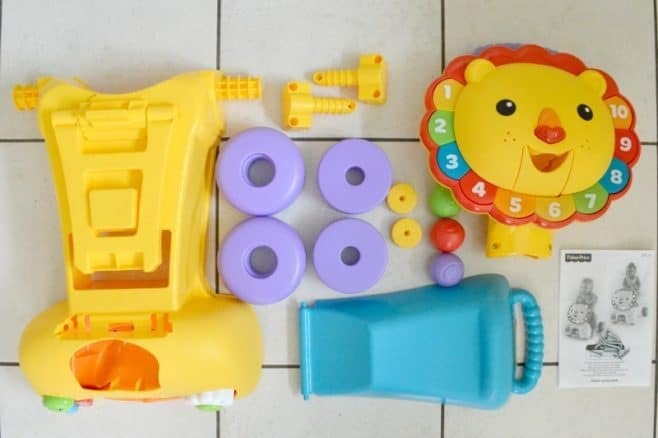 The Fisher-Price 3-in-1 Sit, Stride & Ride Lion arrives requiring assembly. Armed with the instruction leaflet and a screwdriver I was able to out it together within 5 minutes. The clear step-by-step instructions guided me through the process and other than needed to get a different screwdriver I had no issues. 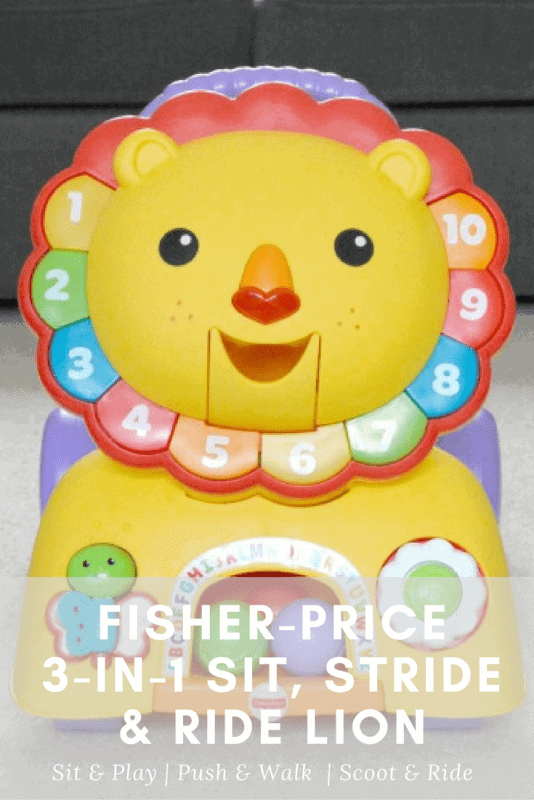 The Fisher-Price 3-in-1 Sit, Stride & Ride Lion helps develop gross motor skills, sensory skills as well as confidence and self-expression. 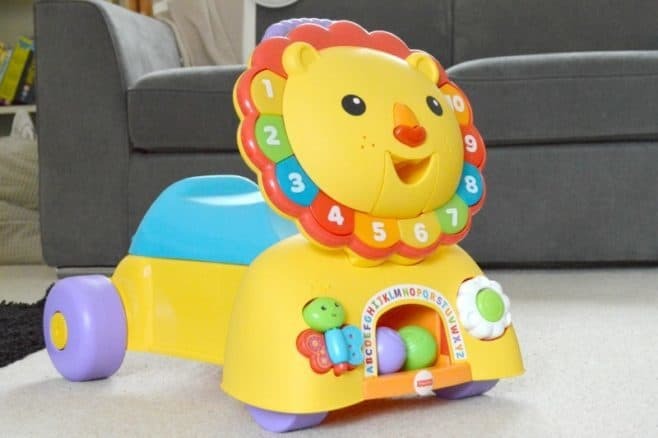 The Fisher-Price 3-in-1 Sit, Stride & Ride Lion is priced at RRP £59.99 and available to purchase from Argos, Amazon, and all other good toy retailers. I don’t know how to express how much Piglet loves the Fisher-Price 3-in-1 Sit, Stride & Ride Lion. As soon as she came down from her nap one afternoon and saw him sitting in the middle of the floor she fell in love. From the buttons to press to the sounds, tunes and phrases to hear. To the balls to collect and chew on (everything goes in her mouth) to the seat to climb upon and sit on. As a parent I love that Fisher-Price 3-in-1 Sit, Stride & Ride Lion is something that will grow with her. She isn’t quite big enough or brave enough to sit on the seat for too long but it’s only a matter of time before she is whizzing along. The seat locks into place whether down as a seat or up as a walker so I can rest assured that she isn’t going to trap her fingers. With lots of different coloured buttons to press and sounds to enjoy, she is loving exploring the lion.